Renters looking for housing in Central Austin will find houses to cost much more than apartments, Community Impact News reports. The average rental home in Central Austin costs $2,232 per month, based on first quarter MLS data. During the first three months of 2015, the average apartment rent was $1,137 per month. The average renter in Central Austin has an annual salary of about $33,827, which is three times less than homeowners in the same area. 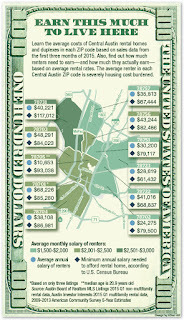 This results in most Central Austin homes and apartments being too expensive for the average renter. Housing costs should comprise no more than 30% of a person's income. Much of the reason that renters are "housing cost burdened", meaning their housing costs exceed 30% of their income, is the dramatic increase in rental rates, which increased 50 percent between 2004 and 2013. Median annual family incomes only went up 9 percent in the same period. Need help finding an #apartment in #Austin? Austin Apartment Specialists can help. Give us a call today at 512-241-1111. 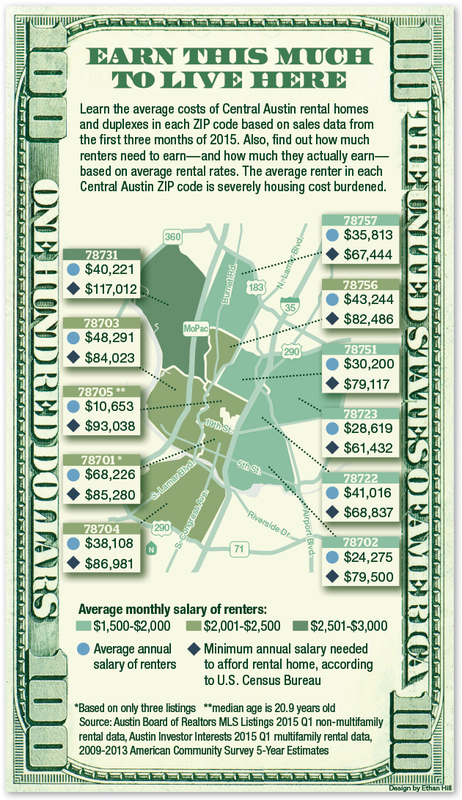 How Much Income Do You Need to Rent in Austin?